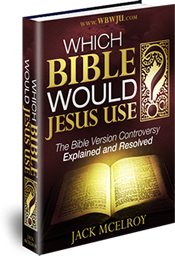 Are you tired of the smirks and childish questions of King James Bible detractors? You’ll learn Why “Which Edition?” is (quite often) a trick question to destroy your faith in a literal book. And the real reason they ask you the fake question in the first place. Why the Lord Jesus Christ would never use the ESV because of the known errors (admitted by experts) inserted into the text in Matthew 1:7, 8, & 10. Why the Lord wouldn’t carry the NASB to church with him because of the known errors (admitted by experts) inserted into the text in John 7:8–10 and because of the way it refers to him in John 1:18. Why the Lord couldn’t use the NIV, ESV, or the NASB because of the known geography error (admitted by experts) inserted into the text in Luke 4:44. Why the Lord can’t use the NIV, ESV, or the NASB because of the known error (admitted by experts) inserted into the text in Mark 1:2. Why the Lord is hurt by how his character is besmirched in Mark 1:41 in the NIV and would never, ever use it. ––Dr. Nido Qubein, President, High Point University, and Chairman, Great Harvest Bread Co.